Even though Lakedale is open year round, many of our guests know us only from our fun and frolicking summertime vibe. But in the deep quiet of winter (which is also a cozy time to stay in our lodge, log cabins or new yurts) the Lakedale elves are always busy at work with loads of projects for the upcoming season. This year we’re adding on to the deck of the lodge just outside the breakfast room. Approximately 800 square feet of new deck, which will join the existing lodge deck, will give our guests more room to sip their morning coffee next to Neva Lake, dance the night away under starry skies and share a bottle of wine with friends. We’ve used a Trex-style product which looks like wood, is incredibly durable, and is 95% recycled. While we were at it, our crack team, headed by Errol, also replaced all the decking on the existing lodge deck and around the sides of the lodge. 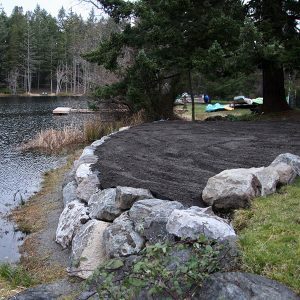 Just north of the lodge deck, before the Neva Lake dock, we filled in a little used beach area to the level of the existing grass, giving you more room to sit on an Adirondack chair and gaze at the lake…or watch your hubby row by while fishing and sipping a beer…and hopefully landing a trout for dinner. One of our great San Juan Island friends is Steve Schramm, of Island Gardens Company. Steve is a talented landscape designer and this fall we asked him to add some landscaping to our new yurt village. It already looks amazing with the addition of native flowering plants, salal, plus deciduous and cedar trees. You’re going to love the additional privacy between the yurts and will feel like your yurt is your own personal treehouse away from home! 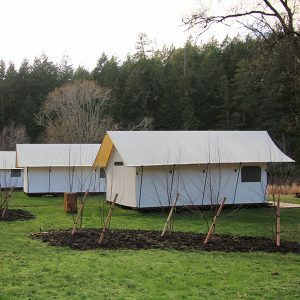 After Steve finished up at the Yurt Village, he made his way to our Canvas Cottage glamping units and added alder and willow trees in front, giving them more privacy from the road – can’t wait to see them all dressed in green this spring! 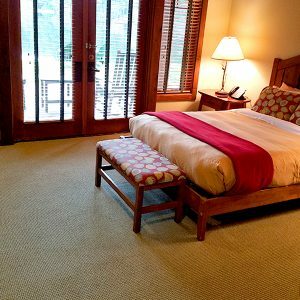 And finally, we replaced the carpet in each of our lovely lodge rooms with a textured, soft and soothing green floor covering. Errol and his team touched up the room interiors while the furniture was out of the rooms. The rooms look better than ever! And keep this under your hats…this December you can look forward to all new king beds and mattresses (instead of the existing queen beds), new headboards, new bedding, nightstands, and a hipper, yet still Lakedale spirited feel. It may be a good enough reason to book a stay in January! 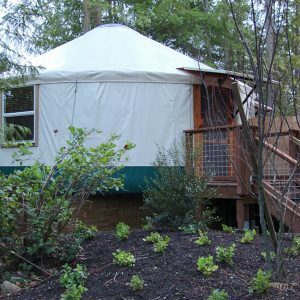 Year Round Glamping - in a Yurt!